The Toyota Yaris is a subcompact sedan with excellent fuel economy, zippy acceleration, an excellent automatic or manual 6-speed transmission, proven reliability, nimble handling with a compliant ride, adequate interior room, and a low price. It’s been restyled recently, and for 2019, Toyota has dropped the hatchback edition. The 2019 Yaris also gets automatic emergency braking as standard equipment, a rarity among subcompact cars. The Yaris uses a smooth and over-achieving 1.6-liter 4-cylinder engine with direct injection. It’s made by Mazda, and delivers 106 horsepower while it returns 35 combined miles per gallon. It’s EPA-rated at 32/40/35 mpg with the automatic and 30/39/34 mpg with the manual. As for safety, the NHTSA gives it five stars overall, a top score for subcompacts. The only thing that keeps the IIHS from giving it the Top Safety Pick nod is the quality of its headlights. The Yaris is available in L, LE, and XLE trim levels. The base Yaris L costs the least, but the well-equipped LE, at about $17,500, is the most popular model. Standard equipment in the L model includes the 6-speed manual transmission, power features, a 7.0-inch touchscreen for infotainment, radio controls on the steering wheel, a split-folding rear seat, cruise control, Bluetooth and USB ports. The LE adds alloy wheels and keyless ignition. The XLE adds a 6-speed automatic transmission, synthetic leather upholstery, automatic climate control, LED headlights, and a few other items. But not even the XLE is available with Apple CarPlay or Android Auto capability. The 6-speed automatic transmission likely to be fitted to most Yaris L and LE sedans is a $1,050 option. You might say the 2019 styling is reverse-tweaked; that is, the bold angles have been made smoother. That makes it less noticeable, but also cleaner. It looks narrow, although its 67-inch width is average for a subcompact car. For a $17,000 car, the materials and finish in the cabin are fine. We have no complaints with the overall quality. The round climate vents have a touch of flair. The standard 7.0-inch touchscreen for infotainment sits high on the dash, while a separate control knob is located in the center console. The infotainment system comes from Mazda, and can require a few hours of practice to use it easily. The front seats are comfortable, in the standard grippy upholstery with a height-adjustable driver’s seat. The synthetic leather in the XLE is new for 2019, and nice. In the rear, legroom is an issue for two adults. It’s a small car, intended mostly for commuters. Children will be able to fit in back easily. The trunk opening is fairly wide, and the trunk can hold 13.5 cubic feet of gym bags and groceries. Every time we drive a Yaris, we are pleasantly reminded of what a well-engineered subcompact this is. The Mazda engine makes an adequate 106 horsepower, and while its acceleration is limited, the direct injection provides linear throttle response. The Yaris is proof that nimble handling and a composed ride can be as much fun as power. The driving dynamics are as good as it gets in this class, with steering that is direct and solid–weighty, if not heavy–and a suspension that’s firm and compliant. The Yaris can actually be entertaining on a twisty road. Its Mazda connection shows. And it helps that both the 6-speed manual and 6-speed automatic are sweet transmissions. The heft at the thick steering wheel is just right, and there is more road feel than many cars with three times the horsepower. The suspension is never punishing and it reacts well to bumpy roads. Highway stability is good, although it will always be difficult to overcome a small footprint on a windy day. 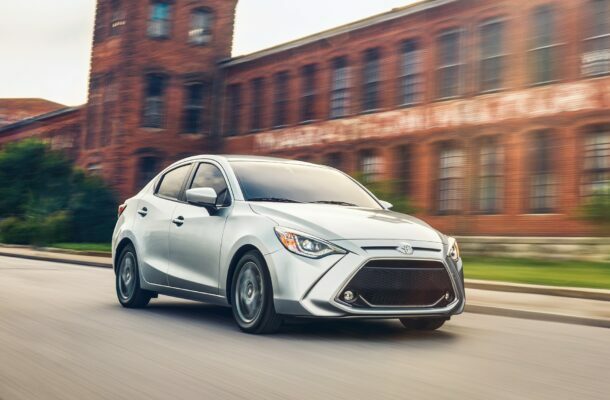 The 2019 Toyota Yaris sedan has good fuel economy, zippy acceleration, an excellent automatic or manual 6-speed transmission, proven reliability, nimble handling with a compliant ride, adequate interior room, and a low price. What more could you ask from an urban economy shuttle?